It's amazing how quickly shipping costs can add up, isn't it? And when you're on a tight holiday budget, you don't want to waste any of it on shipping!! 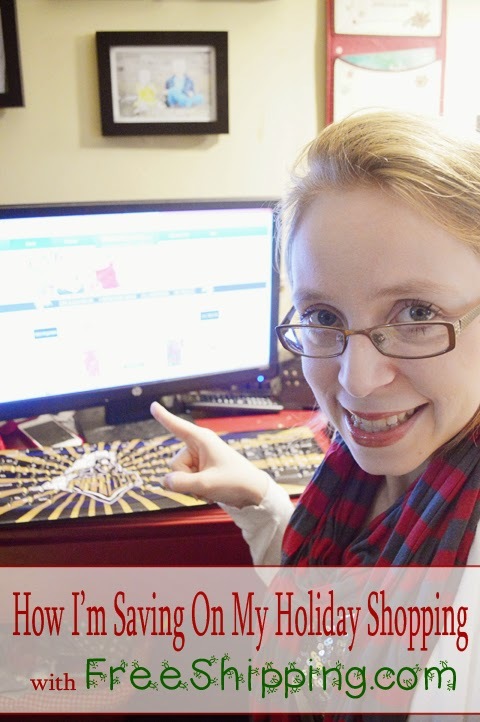 So, this year I found the perfect solution to make my online holiday shopping a little more budget-friendly...FreeShipping.com, which allows members to earn back 10% of their purchases at over 1000 top retailers like Walmart, Kohls, Nordstrom, Best Buy and more!! Plus, members receive free shipping, free returns and price protection too! How It Works. Shopping through FreeShipping.com is super simple! Members simply login, click on any participating retailer's offer and then shop as you normally would! 10% Cash Back. Once the retailer has notified FreeShipping that your order has shipped, they'll apply 10% of total purchase to your Savings Center account! At the end of every quarter, they'll tally up your cashback earnings from the previous 3 months and send you a check for the total! Just by clicking on your retailer's website through FreeShipping.com, you've already saved 10%!! But the savings don't stop there! Compare Prices: The site features a handy search tool that instantly compares the price of millions of items to show you where to get the best possible deal! Coupon Codes. They offer member-exclusive coupon codes for free shipping and other great discounts that can be used at checkout! Using these coupons you can save even MORE than 10%!! Shipping Rebates. Order didn't qualify for the free shipping codes? No problem! FreeShipping.com offers shipping rebates anytime you are charged shipping on orders made through their website! I've found personally I do small purchases from several different sites, which don't meet the free shipping requirements, so this is a huge plus for me!! I don't feel like I need to spend more there than I need, I just submit the rebate!! Easy! Return Shipping Rebates. Need to return an item? No matter the reason, FreeShipping.com will cover it! Whew! Price Protection. Have you ever bought something only to discover it went on sale just days after? Me too! annoying, isn't it? But with FreeShipping, if you find an item you purchased for a lower advertised price within 90 days of your purchase, they'll pay you the difference! Awesome! Sounds pretty great doesn't it? I've been personally using FreeShipping.com for my online Holiday shopping this year and loving the results. So far between shipping rebates and 10% cash back, I'm looking at getting back nearly $40!! And I'm just getting started! With so many stores to choose from, I can do nearly all my holiday shopping through them! Now, I cannot show you exactly what I've purchased (in case any snooping husband or kiddo oversees! ), but I can tell I've gotten some pretty awesome gifts at some pretty awesome prices. I feel confident that I am getting the absolute best deals while still giving my family a wonderful holiday! With their 10% cash-back offer, FreeShipping.com members already receive a bigger discount on online purchases than other subscription program offers, but from Black Friday to Cyber Monday the savings are going up!! Each day from November 28-December 1, they'll be offering 20% cash back at five different retailers per day!! Participating retailers include Walmart, QVC, Sears, Children's Place, Gap and Nordstrom!! If you're looking for another great reason to avoid the Black Friday crowds, this is IT! Ready to start saving? Great news...use the coupon code HOLIDAY2014 on FreeShipping.com to begin your FREE 30-day trial and receive a discounted monthly membership rate of $9.95/month after the trial is over! What are you waiting for? Start saving today! What would YOU shop for through FreeShipping.com?